This entry was posted in Animals & Zoos (動物と動物園), Photography (写真) and tagged シカ, ニホンジカ, deer, 鹿, forest, sika deer, spotted deer, 森 by T Ibara Photo. Bookmark the permalink. The fawns are beautiful. They made me smile. Very great picture, well done!!! That is so very cool, Takami san.. Why aren’t you posting more often? Thank you dear Sartenada 🙂 I hope you are having a good summer. There is something magical about seeing ‘babes in the woods’ and of all the little creatures, I think the sight of a little fawn is the one that makes everyone reflect on how beautiful nature can be… great shot Takami, you frame them so well in this shot too! Cheers to a great summer. Oh yes, it was something special (and a real treat) to see this little fawn completely at home in the presence of its parents in the woods. 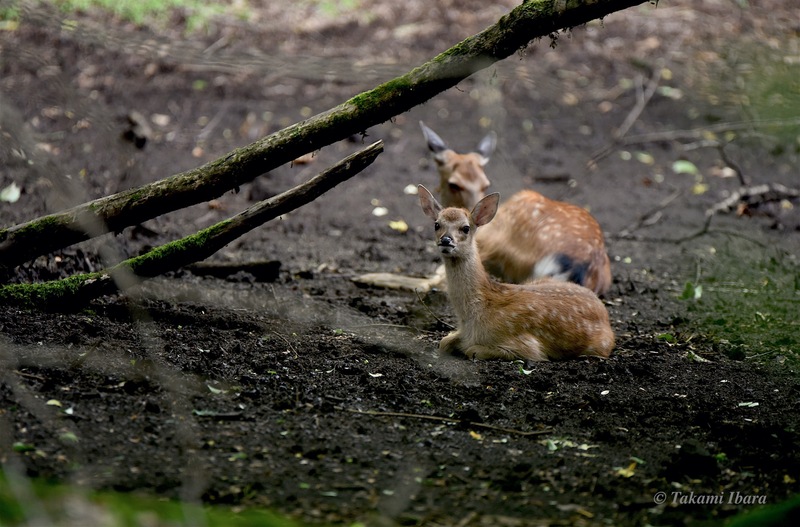 Something I often daydreamed about as a child – having a ‘Bambi’ experience in the forest – and what an unexpected treat it was on this day. It’s thanks to the 600mm lens from hubby that I could keep a distance and make the shot without having to rely on trimming or anything fancy. So I guess all the thanks go to him 😉 I hope you’re having a good summer. The rainy season has ended in Tokyo, which means very hot weather! So happy to hear from you! Yes, it was a very special treat to see fawns in the woods. It was my first time experiencing it, and what a treat it was. I love their spots too. The deer here keep their spots, even when fully grown (! ), and they look absolutely adorable on the babies. It was thanks to the 600mm super duper "bazooka" lens that hubby gave me last year, that I was able to make this shot. So all credit and thanks go to him 😉 I am glad you and your partner are having a good summer. Will be in touch again soon! That’s so sweet, Takami! Safe with his mama. Beautiful, peaceful image. Hello :). With pleasure :). Thank you dear Indah ❤ Hope you're having a lovely summer! So tender and beautiful. Wonderful! We had a very young fawn curled up at the base of a tree on our property one day. We were having our roof replaced and the roofers found her. I figured her mother had put her there that morning so she could go eat somewhere, but the roofers arrived early and made a lot of noise so she wouldn’t return. We went out to dinner that night and our darling little fawn was gone when we got back. Happiness! I didn’t want to have to call the wildlife group. What an experience it must have been to see the baby right on your property! I am glad that she was reunited with her mother and that all went well 🙂 I hope you are having a lovely summer. They look so completely at peace, as though they are completely unaware of your presence. An absolutely beautiful capture my friend. Kudos. Hello friend! Apologies for the delayed response, and thank you so much for your lovely comment. It was a special moment indeed, and (like many good things) was completely unexpected. I was able to keep a good distance from them, thanks to the wonderful 600mm lens my husband generously gave me as a birthday gift last year. Without it, this shot would have been impossible. I hope all is well with you, and your beautiful city. Well you certainly are making good use of your birthday gift. As for my city, everything is well, and the summer is finally setting in after a few false starts, so there are a lot more happy faces on the streets these days. I hope you are enjoying your weather also. This is a wonderful encounter, your picture is beautiful, I love it. Thank you for your nice comment 🙂 It was a wonderful encounter, very special to see them in the forest. I hope you have a beautiful summer too. Great capture! Wonderful creatures… so contented in their natural habitat!